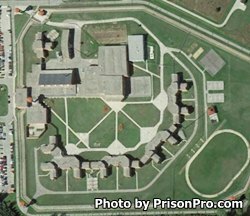 Columbia Correctional Institution is a maximum security prison located in Portage Wisconsin. This prison is rated to house 650 adult male offenders, and has a current population of around 825 inmates. Columbia Correctional Institution is comprised of ten housing units which have 50 cells in each. Additionally this facility houses 150 minimum security inmates. Many of the cells are double bunked, single cells are reserved for the most violent and dangerous inmates. Offenders have access to a chapel, gym and recreational areas, various health services, a library, the canteen, and a sizable visitation area. Inmates are secured by electronic detection equipment, five large armed guard towers, and double razor wire electric fences. During an inmate's incarceration at Columbia Correctional Institution they can receive vocational training in custodial/building maintenance, and print works. This facility participates in the Badger State Prison Industries program, and offers select inmates on-site employment performing printing and mailroom services. A dog therapy program is provided for inmates in social isolation through a partnership with "Dogs on Call" and enables offenders to interact with canines and their handlers once per month for 1.5 hours. Education courses are provided and allow inmates to earn a GED, receive adult basic education and even participate in correspondence courses towards an advanced degree. Anger management, mindfulness meditation, and cognitive intervention programs are also offered to inmates at Columbia Correctional Institution. For more information on this prison you can read the comprehensive annual report here. All visitors must have an approved visitors application on file prior to attending a visitation session. Visitation is offered everyday for eight hours each day. Afternoon/evening visitation is available Monday-Friday while the weekends offer morning and afternoon visits. You must contact the facility for the current visitation schedule and to find out which day your inmate is allowed visits on.